Shown above is a beautiful 2 door Deco vanity unit, inspired by a famous cabinet by Jean Dunand from 1921. Dunand produced some of the most striking high quality Deco work in France. The original was a joint venture between Dunand & Jean Goulden, & featured an abstract landscape design around the carcase. 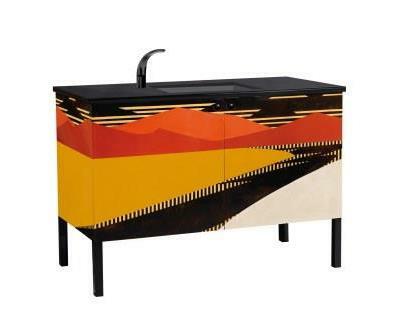 Even though polychrome painted the cabinet looks very crisp & graphic. This would make a stunning center piece in any bathroom. We could design your bathroom around this piece. The vanity is shown with a black granite worktop, to match the original piece. 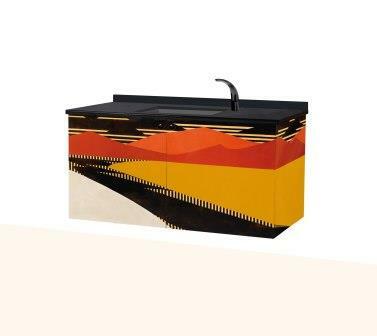 It is shown with a black undermounted sink, to keep the top visually black & dramatic. You can of course change the sink colour to a white, ivory, grey, etc. sink. The tap options are for you top decide. The whole piece stands on slim black legs. The interior is fitted with a shelf. Fitted with discreet black door knobs. As made to order we don't give sizes until we've agreed a spec with a customer. 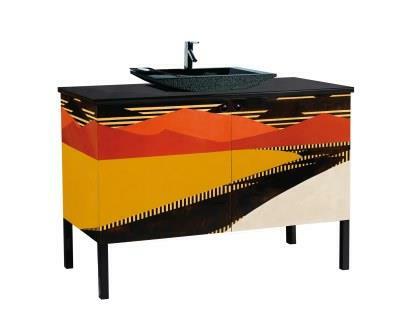 The vanity unit could equally look more contemporary by having a sit on basin, such as the example shown above right, with a black granite sink (shown below) whose shape echoes the hills in the painting. Another option that would work very well is to have the vanity as a wall hung piece, as shown above right, which is even more mimalist in style. This version also has a small upstand, which any of these versions could have.